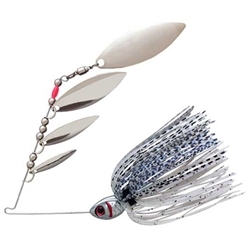 The Booyah Super Shad Spinnerbait is one of the true originals in quad-bladed spinnerbaits. This 3/8oz spinnerbait has a unique profile that mimics a school of fleeing baitfish. The Super Shad comes equipped with 55-strand Bio-Flex skirt, and super sharp 4/0 Mustad Ultra Point hooks.